Today, Grand Chief Alvin Fiddler of Nishnawbe Aski Nation and Canada’s Minister of Indigenous Affairs Carolyn Bennett formally signed an Agreement creating a ground breaking Remoteness Quotient (“RQ”) Table to develop a new funding formula that equitably accounts for the unique challenges and consequent costs of providing child welfare services in northern remote NAN communities. Falconers LLP is honoured to be part of the negotiating team at the RQ Table. The RQ Table is intended to create a confidential collaborative process by which information sharing between NAN and INAC can occur in respect of data, statistics and empirically-based social science research with a view to creating a remoteness quotient that could ultimately be applied to the delivery of funding to remote and isolated communities of NAN. The concept of a Remoteness Quotient was introduced in formal submissions by NAN in the ongoing Indigenous child welfare proceedings before the Canadian Human Rights Tribunal (Tribunal), First Nations Child & Family Caring Society of Canada et al. v. Attorney General of Canada (representing the Minister of Indian and Northern Affairs). The RQ is conceived by NAN as a method to address discrimination in funding child welfare services in remote and isolated Indigenous communities. The application of the RQ that is to be developed would ensure that the same levels of child welfare services are available in the North as in the rest of Canada, despite the additional costs of remoteness. 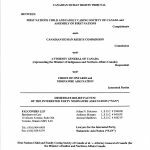 Immediate Relief Book of Authorities February 28, 2017, Nishnawbe Aski Nation.